On May 13, 2009, Brooklynguy wrote a post on his eponymous blog called "The Mosel and the Sulfur Stench" and asked his readers why many Mosel Rieslings, especially those from the celebrated estate of Joh. Jos. Prüm, in Wehlen, tend to have an off-putting sulfur dioxide (SO2) smell. At a professional tasting of "2007 in Germany" for Wine & Spirits, he even describes one bottle of J.J. Prüm that stinks of hard-boiled eggs and another that smells bad, too—which, at the time, he also associated with SO2. Back then, I replied to Brooklynguy's blog post a few times. My comments, however, could have been more thorough and better written. I also didn't know if the Prüms vinified some of their wines in pressure tanks as well. It turns out that J.J. Prüm ferments and ages its Mosel Rieslings exclusively in stainless-steel tanks and sulfur levels have been no higher than most other producers in the region. Katharina Prüm has pointed this out more than once. As I indicated in one of my comments, the smell is often a sponti stink. There's no question that some Mosel winemakers use high amounts of SO2. Many of these are for sweet wines, but not always. Other winemakers have backed off with the amount of SO2 in the last several years. 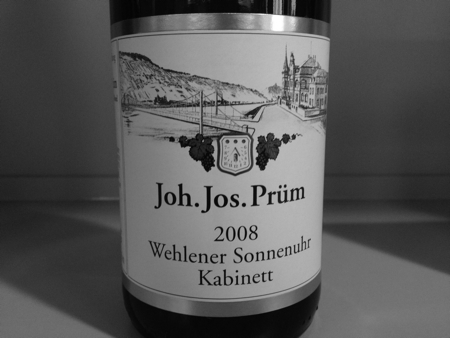 The stink from J.J. Prüm's wines isn't always one of SO2, though. The smell is usually different from the pungent sulfur odor of a struck match. In addition, the still very young (and very good) 2012 Willi Schaefer Graacher Himmelreich Spätlese and Graacher Domprobst Spätlese showed a little SO2 on the palate in November 2013. In these instances, the SO2 is noticeable, but it usually goes away with some air or time in bottle. Yet if Brooklynguy smelled hard-boiled eggs, this reduced note usually indicates hydrogen sulfide (H2S). So as the critic who spawned this whole discussion, I suppose I ought to clarify myself. I didn't say that it was sulfur, I said that it imitated sulfur, because if you've never smelled this particular component before, the smell of sulfur is usually the closest associable thing that you can relate it to. In fact, it is an identifiably and distinctively different smell than either SO2 or H2S—I disagree with brooklynguy that it smells of eggs. It has nothing to do with sulfur, but rather the sponti stink that Lars refers to. It can be accentuated by reduction, but it is not purely a reduction character either. For whatever reason—I'm not a scientist so I can't tell you—it tends to be particularly pronounced in young rieslings from the Mosel-Saar-Ruwer that have been grown on slate and fermented by ambient yeasts. (Best and most consistent examples are JJ Prüm and Nik Weis.) Unfortunately, the vast majority of people, including most wine professionals, mistake this odor for sulfur, but if you take the time to compare the two, it is easily distinguished. It's a very complex issue and you have to have a little knowledge about chemistry to really understand why. First, there are different types of Böckser (sulfide off-flavors) that can arise for different reasons and that come about in different ways and generate a composite impression. Individual steps during vinification add up [to form this taste impression]. To begin with, there is hydrogen sulfide (rotten eggs). This can transform into increasingly complex organic sulfur compounds to form mercaptans, which then can smell of cabbage, cheese, sweat, leather, and burnt onions, among other things. There is Hefeböckser, an off-flavor from yeasts, which arises when wines are aged too long on the lees, the yeast cells autolyse, i.e., the yeasts die and decompose. Both of these [aforementioned] wine faults can take place in the same wine. Then, there is Aromaböckser, an aroma off-flavor, that is a result from spontaneous fermentation by the formation of certain aromatic substances, which may be perceived quite positive, but if the concentration is too high or if there is a combination with other substances, they can have a negative effect. Generally speaking, off-flavors are much more likely to result during spontaneous fermentations than with fermentations from Reinzuchthefen, or selectively cultured yeasts. In addition, a long—perhaps, too long—lees contact; an airtight upbringing (in stainless-steel or fiberglass tanks—i.e., no wooden casks); and high dosages of sulfur—for example, to arrest fermentation. In cellars, "ambient yeasts" can develop that may also contribute to off-flavors. If all of this is happening at Herr Prüm's, then this explains the "stench." That is to say, the following can contribute to the development of off-flavors: molecular sulfur in wooden casks, spontaneous fermentation, ambient yeasts with enhanced reductive metabolism, stainless-steel tanks, excessive lees contact, high fermentation and storage temperatures, and high sulfur dosages. A simple test would be to put in a glass of wine a copper coin, in the other nothing. If after 10 minutes the wine with the coin no longer "stinks," it's an off-flavor from hydrogen sulfide. If the coin has no influence on the wine, then a more complicated fault, the so-called storage off-flavors (Lagerböckser), exists that are difficult to eliminate and have more complex causes. The off-flavors have nothing to do with individual vineyard sites, different soil types, or different grapes varieties. It is only a matter of vinification. If too much sulfur is perceived in the wine, then this is a rather pungent odor and not "stinky." As mentioned above, it's a complex issue that is perceived very individually. Some notice every little odor deviation from a standard vinification (excluding cultured yeasts) as a Böckser, others find the "stinky aroma" not as such, but rave about the flowery, complex flavor. I hope you can understand my remarks. I think chemical formulae won't bring you much further along, but rather the somewhat popular descriptions. Of course, I can give you formulae. I had a lot of people over at my place and only had time to write something tonight. Photograph of Ulli Stein writing formulae on a Doppelstück, taken by Tobias Hannemann. An interesting article about a subject that truly engage lovers of riesling. I’ve heard from fellow tasters around the table that they regard this as a fault from the winemaker, but that’s clearly not the case. I have been following J.J. Prüm from the 2004 vintage (on Kabinett and Spätlese level) and at the moment it seems the 2007’s Kabinetts are drinking well. An initial “stink” is there, but goes away very quickly with some air. Other producers have this aroma too, more or less, but not that powerful as in J.J. Prüm’s wines (my experience). Thanks, Kjetil. Some winemakers, like Helmut Dönnhoff, would agree with those “fellow tasters” about Spontis. It’s not always viewed as a sign of quality or purity. Other tasters and winemakers like a little stink. Besides J.J. Prüm, Peter is right about Nik Weis’s St. Urbans-Hof wines having a marked sponti smell as well. I forgot to point out that I’ve come across J.J. Prüm wines with an H2S stink, too. In fact, Terry Theise says in one of his older German catalogs, which I found via Google, that the “Mosel stink” comes from H2S, such as from a long lees contact. He mentions this in regard to the wines of Ansgar Clüsserath. Eva Clüsserath likes to spontaneously ferment with ambient yeasts and age her wines on the gross lees in Fuder. Another point that I forgot to make in my article is that wines with higher residual sugar tend to have more stinky aromas. Ansgar Clüsserath is a perfect example of this. Her sweeter wines stink more than her drier wines do. Terry also talks about nitrogen-depleted soils that (I’m paraphrasing him here) make for weak yeast populations and, in turn, slow fermentations, which create “so-called ‘Bockser’ aromas (hydrogen sulfide) along with the naturally caroby sponti note.” He points out that this can be more extreme if the wines are fermented in stainless-steel tanks and bottled under screw caps. The latter is his profile of Gysler in Rheinhessen. At the end of Terry’s profile of VOLS, he makes another important point: “Again I find I must observe; y’all accept all manner of dubious aromas in wines you approve of because of where they come or what ‘natural’ imprimatur they carry. But the first whiff of funk in a German Riesling and you assume they’re trying to poison you with sulfur.” See Martin Kössler’s article on pH values, which debunks some myths about what causes headaches. It should be noted, too, that a sponti aroma doesn’t necessarily mean that the wine is fermented with native yeasts or is more “natural.” In addition, there are cultured yeasts that are specifically manufactured to smell like a sponti wine. Terry smells carob, or even chocolate, in many sponti wines. I need to smell a carob and, other than Terry, I’ve never heard of that association before. I don’t know about chocolate either. There is chocolate with carob, too. I smell more smoky notes. As for Terry’s theory that the Fuder is a possible reason for more sponti wines on the Mosel, I would disagree. J.J. Prüm and Schloss Lieser, for example, have pronounced sponti aromas and ferment exclusively in stainless-steel tanks, which probably accentuates it. Though Thomas Haag, like Ulli Stein or Johannes Selbach, uses cultured yeasts for certain wines, especially those that are meant to ferment dry. Stein and Selbach-Oster vinify more of their wines in old wooden 1,000-liter Fuder. They each prefer the slow micro-oxidation on the lees. “I also have a dim hypothesis (very preliminary, merely intuitive, barely tested) that slate soils may play a role in creating that typical Mosel-sponti aroma, because it recurs in certain Mittelrhein and even Nahe wines,” Terry says in a Wine Berserkers’ thread about cultured versus native yeasts. That’s the same point that Peter makes. Karl-Josef Loewen once told me he tolerated the sponti smell in young wines because, he said, “behind it is an aroma you can’t get any other way.” This seems to be true. And Lars (and others), I have come to understand that sponti is irrelevant to fermentation in wood, because of my experiences with Gysler, among others. If we agree that the aroma is inconvenient, assuming we’re trying to sell – or merely drink – the wines in the first 1-3 years of their lives, then the question becomes one of complex parameters of values. What shall we tolerate to reach a goal we feel to be desirable? What are the costs of preserving this dialect? How much inconvenience is too much? I have great respect and regard for Nik Weis’ wines, but the last bottle I drank was stinky all the way to the bottom, two hours after the cork was pulled. I have an intuition – again unproven, just an instinct – that this isn’t actually necessary, that you can get the purity and soulfulness you seek without imposing quite such an inconvenience to the drinker. I like this type of wine very much. It speaks to my heart. I like other “tidier” wines also, sometimes just as much, but they thrill my senses while the old-school soothes my soul. Still, everyone is enmeshed in a matrix of choices, cellarmasters and drinkers and merchants alike, and I think a salient question might be: How much can we reasonably demand of our customers, in order to preserve this wine style? Terry: Thanks for your reply. I agree that it’s unpleasant if the wine is overly stinky. A spontaneously fermented Mosel Riesling doesn’t need to be that way. I’m more bothered by sulfur (struck match), though. Thanks for your excellent comment and explanation, Jörg. As Ulli pointed out, too, each taster is different. I agree with your point about the wine remaining stinky is not a good thing. Terry says the same in his example of that last bottle of St. Urbans-Hof Riesling. Great article and comment thread. Tons to digest here (especially for the scientifically illiterate). I’ve seen references to “Boecksergeschmack” dating back to the early 19th century. Also, for anybody eager to try the “copper test,” keep in mind that the U.S. penny alloy, since 1982, has been predominantly zinc with only minimal traces of copper. Thanks, Kevin. It’s good to know that you’ve come across early 19th-century references to Böckser. I didn’t realize that the penny was mostly zinc. I’d like to add that Maximin Grünhaus, for example, has usually marked sponti wines in the last several vintages again. The ambient yeasts in their cellar are different from others, which gives character to the wines. 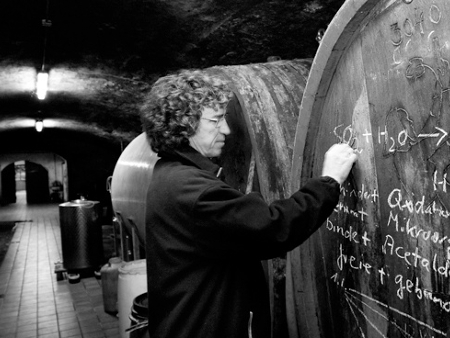 Another point that I forgot to mention in my Mosel-stink piece is how a winemaker defines a spontaneous fermentation. There are some Mosel producers who are more dogmatic—or, better, consequent—in their approach. They believe that each and every tank or cask should begin fermentation spontaneously, without inoculating with either a single-yeast strain or an ambient starter culture from another batch of spontaneously fermented wine in their cellar). In other words, they prefer to just wait it out, even if it takes longer for the must to start fermenting. Other winemakers prefer, however, a more brisk fermentation and, if need be, will help get it started in order to avoid a long-drawn-out fermentation, which often leads to malo and more full-bodied wines. I don’t see an issue with adding ambient yeasts from another cask, or even cultured yeasts. (When a winemaker specifically adds a starter culture for all the different fermenting musts, then it’s called pied de cuve.) Of course, some winemakers add cultured yeasts or heat the fermenting must in order to get it under 9 grams of sugar. They also can blend among different tanks or casks. An interesting discussion. I’m sorry to say this with Terry here, but in terms of offputting sponti aromas in young Mosel Rieslings, the worst offender that I’ve encountered was a 2007 Loewen Kabinett that I opened back in 2011. A heavy stink of hubbard squash (a particularly vegetal tasting variety of winter squash)that overwhelmed the wine, and never completely left after two days. Not that this is any indictment of Loewen’s wines, which are normally extremely good. Curiously, I’ve had quite a few of Nik Weis’ wines, and never had one with a particularity stinky aroma yet. You just never know. In an odd coincidence, which I’m sure that Terry is aware of: in Massachusetts, Terry’s portfolio is distributed by Atlantic Imports. The only other German producer whom they represent is St. Urbans-Hof. Thinking about the matter for a while, I should add some remarks. The winemakers call it “sponti stink” that somehow tells us about the amount of knowledge available. But stinking wine is far too annoying to shrug it away, even more so when you paid the bill. So assuming that no one would bottle up sticking wine, it all happens in the closed flask. We’ll there are just two options then, either too much sulfites have been added and the two sulfur forms – natural occurring thiols in the organic molecules of the fermented juice and inorganic sulfite added by the winemaker- are disproportionating to liberate hydrogen sulfide … too much sulfites are surely no good! Second option is rather the opposite, yeast or bacteria are getting back to work, in need of food they deteriorate thiol-containing molecules and liberate the stink this way. Now that would place the winemaker in a better position, since the residual habitants of the bottles are different each time, depending on the quality of the must, the barrels used and the general microbiological population of the wine yard. (The latter does somehow make sense, since some wines/producers seem more prone to “stink” ?) However, more sulfite will not necessarily do the trick, no one knows whether the “stink”producers are resistant or not too high sulfite levels. One would need to do some serious scientific experiments to rule out the most obvious reasons … in the meantime, just hand in the stinking bottles for refund, no matter where you bought them! Jörg, I don’t mind a little stink from volatile sulfur compounds if it blows off. I just find it sad when experienced tasters think it’s a sign of quality or assume that such wines are definitely spontaneously fermented and those that don’t stink are not sponti. There are plenty of producers who claim to ferment with ambient yeasts, but they buy packs of cultured yeasts come harvest time. In addition, I don’t think some producers who ferment spontaneously with ambient yeasts in a more reductive manner should bottle their wines under screw cap. It accentuates the stink. Oliver Fischer and I talked about this the other day. In conversation with several winemaker’s from the Loire (Sancerre and Savennieres), wines often “tainted” with sulfur-like stink, all mentioned that the low pH values in these wines interfered with the absorption of both sulfur and sulfide compounds. The result is a highly reductive quality that dissipates with aeration or long bottle aging. I think the earlier mention of pH and its relation to Mosel stink may be worth further investigation. Thanks for your reply, Dennis. I wonder if the combination of low pH and, for example, a reductive fermentation (airtight stainless-steel tanks) accentuates the stink. There are producers that have low pH values and ferment with ambient yeasts, but they don’t have the stink. They use lower amounts of sulfur and ferment in old oak casks. To make sweet wines, most winemakers arrest the fermentation by cooling and then sulfuring. During my apprenticeship at Hofgut Falkenstein, I’ve learned that the key—besides good grapes of course—is to keep only the good stuff (no filtering the dregs) after a natural sedimentation and to avoid off-putting aromas at the outset of spontaneous fermentation with native yeasts. The Webers don’t add commercial yeast strains. And if stinky sponti smells do occur, they add a little of the clean leftover sediment to the fermenting wine, rather than diammonium phosphate (DAP), to supply the yeasts with more nutrients.